Sergei Gonchar began playing hockey in Chelyabinsk, but years went by before he managed to make it on to Traktor’s first-tier team. “Sergei was inconspicuous, but his attitude to hockey was highly professional. He knew precisely what he wanted. Already at that time he saw his goal clearly,” said his first coach, Viktor Peregudov. Gonchar was not considered the best prospect and he considered ending his hockey career more than once, however, he heeded Peregudov’s suggestion to spend more time on the rink. Gonchar was an attacking defenseman from childhood. “He could play in the attack line because he always found a chance to attack, and not at the expense of defense. When he made the junior team, Coach Vladimir Bogomolov immediately noticed Sergei’s first pass. I kept statistics at a tournament in Finland and 19 out of every 20 passes were accurate,” Peregudov continued. Gonchar’s big break came during the 1991/92 season when he began playing for Traktor Chelyabinsk in the Soviet Championship League. Though his stats were unimpressive (31 matches, 1 goal), he proved to be an excellent defenseman and caught the eye of Dynamo Moscow. “At the time, playing for Dynamo was prestigious. Especially since the Dynamo coach was Vladimir Yurzinov and the team included Kozlov, Kovalev and Yashin. Yurzinov also praised Gonchar. He went personally to Chelyabinsk to recruit him,” Peregudov said. Gonchar spent the next two seasons playing for Dynamo, becoming a national champion in 1993. His attacks hardly ever ran counter to the interests of the team. For two seasons, Sergei was the best under the “+/-” system. Over three seasons, Gonchar played a total of 106 games, scoring six goals and making eight assists. His style of play drew the attention of NHL clubs, and Gonchar decided to continue his career in the U.S.. At the 1992 NHL Draft, he was selected in the first round, 14th overall, by the Washington Capitals. Gonchar had to start off in the AHL where he played 61 games for the Portland Pirates. But his appearances convinced his coaches that he had the right stuff, and he was invited to join the first-tier Capitals team for the 1994/95 season. He was a Washington regular for the next few years, not counting the beginning of the 1997/98 season when, because of a contract dispute, he returned to Russia and played seven games for Lada (Togliatti). In 1998 the Capitals, with Gonchar back on board, reached the Stanley Cup finals. Meanwhile, Gonchar’s results had improved. During the 2002/03 season, Gonchar set a personal record, racking up 67 points in regular championship play and another five in six games in the playoffs. The following year, his 10th season with the Capitals, Gonchar was traded to the Boston Bruins for Shoane Morrison and two draft picks. But Gonchar played only 15 championship games and seven games in the playoffs for the Bruins before the NHL lockout was announced. Gonchar is the record-holder among Russian defensemen for number of goals in regular championship play (214). This number puts him in 18th place among all defensemen in the history of the NHL and in 4th place among defensemen playing today, after Rob Blake (240), Nicklas Lidstrom (237) and Mathieu Schneider (223). Sergei Gonchar is that rare defenseman who is also a high scorer. Every season he scores more than 12 goals and makes more than 50 assists. He is often invited to play in NHL All-Stars Games. Gonchar’s father is a gas-and-electric welder; his mother worked for the telephone company. Both parents were huge readers and Gonchar began devouring books at the age of six. His favorite place on earth is St. Petersburg. While still playing for Traktor, Sergei fell in love with Russia’s northern capital. With his first pay checks from the NHL, Sergei bought several apartments in Petersburg and moved his whole family there. Although he met his wife, Larisa, in Moscow while he was playing for Dynamo, they were married in St. Petersburg. Gonchar is also something of a film buff. He likes old Soviet classics as well as such non-Russian fare as “Once Upon a Time in America,” “Get Shorty” and “Gladiator.” Gonchar prefers virtual poker to hockey on his computer. He also likes to go to concerts when he can: the Rolling Stones, for example, or Peter Gabriel. 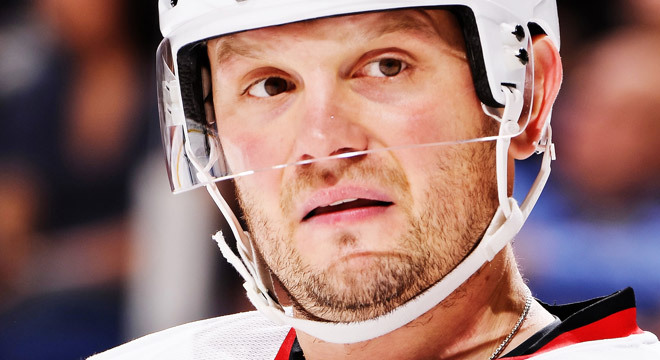 When his career is over, Gonchar’s dream is to try parachute jumping.